Here’s an interactive Google Earth browser view of a false-color image of the Springs Fire scar from the Landsat Data Continuity Mission’s Operational Land Imager. The image was recently featured on the NASA Earth Observatory web site. The image date is May 4, 2013. According to the description of the image on Earth Observatory unburned vegetation appears dark green. Burned areas are red, and the most severely burned areas are generally the darkest. Actively growing farmland is light green; plowed fields are brown. Buildings and roads are gray. This is a 3D view that can be zoomed,rotated and tilted. It includes the GEOMAC fire perimeter timestamped 05/07/13 0348. Placemark locations are approximate. GPS tracks from various runs have been added to mark many of the area’s trails. 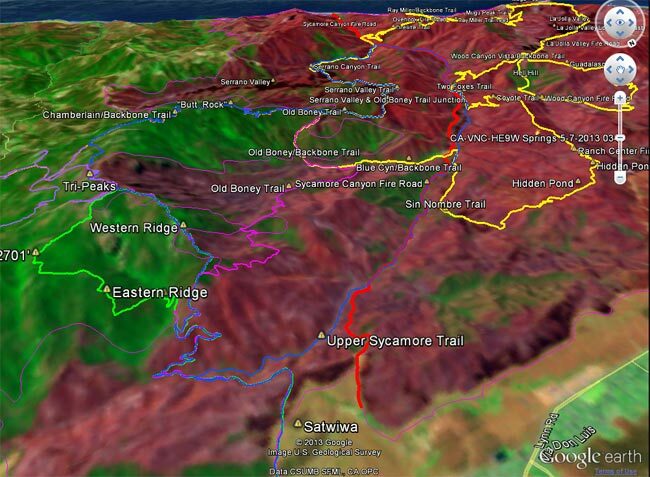 The red track is Sycamore Canyon Fire Road. Requires the Google Earth plugin. The overlay is large and may take a while to load.